AMHERST, Mass., Oct. 27 (AScribe Newswire) -- A center for academic research and scholarship related to science in Muslim societies has been established at Hampshire College. While research centers and academic programs for general study of Islam and Muslim societies exist at other colleges and universities, the Hampshire center is unique in its approach and focus on science, says Salman Hameed. 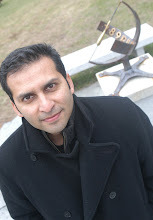 Professor Hameed, who teaches integrated sciences and humanities and has been working on understanding the reception of biological evolution in the Muslim world, has been named director of the new Center for the Study of Science in Muslim Societies (SSiMS) at Hampshire College. "There is an increasingly urgent need for understanding and education about Islam and Muslim societies," said Hameed. "This is perhaps the only center focused on examination of intersections and interactions between science and Muslim societies, (both in Muslim-majority countries and in Muslim diasporas in the West). It will bring together scholars working across disciplines on a significant set of questions and issues." At a time when science is becoming increasingly important in everyday life and for economic development, it is important to understand how it is understood and taught, and the role it plays in various Muslim societies, where religion plays a significant cultural role, Hameed said. "This relationship with science is complex, and increasingly so, as science is freighted with issues of colonialism, modernity and progress, as well as moral and religious implications." SSiMS builds on and extends work already being completed at the college, which is a member of Massachusetts' distinguished Five College consortium (Hampshire, Amherst, Mt. Holyoke, Smith Colleges, and the University of Massachusetts Amherst). Hampshire College hosted an international conference on Darwin and Evolution in the Muslim World in fall 2009. A separate research project, funded by the National Science Foundation and being conducted by professors at Hampshire, Northeastern, and McGill University, is studying the acceptance of biological evolution and perspectives on science and religion among Muslim physicians and medical students in eight different countries. An ongoing Science and Religion lecture series at Hampshire brings top scholars to campus to speak on a wide variety of issues, with some of the lectures related to Islam and science. SSiMS research will be interdisciplinary, with a mission of building knowledge and understanding of how social, political, historical, and religious factors influence- and are influenced by - the methodologies and findings of science. Perspectives from science, the humanities, and social science will be integrated, with scholars working across fields. One goal of SSiMS is expanded course offerings in collaboration with faculty across the consortium, which offers a Five College Certificate Program in Middle Eastern studies. Another goal is to host young research fellows in a variety of fields who are interested in the study of science in muslim societies. "The center will build on Hampshire's existing strengths in science education and our interdisciplinary approach to research and pedagogy," said Hameed. For contact information, check out the press-release. I congratulate Professor Salman Hameed for establishing a center for academic research and scholarship related to science in Muslim societies, at Hampshire College. I don’t even know why something like ‘Science in Muslim Societies’ should have a new centre. Why not Economics in Muslim Societies or Business in Muslim Societies, etc? Are there such organisations as well? Never heard of any. Why is science such an important issue? Because everyone wants to teach Darwinism? I hope this centre will focus not on validating Darwinism with rhetoric like ‘Darwinian evolution is a fact’ but only in showing evidence that actually shows how evolution occurs. I also hope Professor Hameed will be more sympathetic to those who do not believe in Darwin’s theory the way it is propounded by most evolutionists. So far, i have failed to see such a vew point on this blog. I suppose 9:51 AM is too early for Champagne. Congratulations, anyway! I know one story (imagination) of H.G.Wells. About 35 years ago when I was doing my first degree course in science, one of my senior colleague told me a story from Time Machine that a day will come when the size of humans would of size of a rat. Now see what has actually happened afterwards. About 2 or 3 years back I saw in a news paper that a giant sized rodent fossil had been found. This was almost to modern elephant size. This confirmed my belief that dinosaurs had not been wiped out. They are still found in smaller and smaller size, yes of course with some different characteristics. I think Gravitation Force is one of the major cause of genetic mutation. Gravitation Force is gradually increasing towards centre and compressing all members of animal kingdom bringing about genetic change with respect to size. A new evolved species or same species with some new characteristics created. I further believe that humans and dinosaurs co-existed. I know one evidence in support of this. "Why is science such an important issue?" Perhaps, because our contemporary world is deeply shaped by modern science - the importance of science in everyday life will only grow with time. But it is not only science-driven technology that is relevant here, but also the way we talk about religion, wonder, and awe - as it has also been dramatically altered by discoveries in both cosmology and biology in the past couple of centuries. With respect to the question asked by one of the posters, science is also important because it promotes critical and systemic thinking. ""Why is science such an important issue?" Perhaps, because our contemporary world is deeply shaped by modern science . . . "
But, let us not forget that BEFORE the world was shaped by science, it was also shaped by religion. And the contemporary world's grip on religion is no less. So, if we are thinking of addressing what shapes the world, let us start with chronological order. ". . . the way we talk about religion, wonder, and awe - as it has also been dramatically altered by discoveries in both cosmology and biology in the past couple of centuries." What discovery are you talking about? Darwin spoke in similar terms. But he was too scared to completely rule out God and say so even though he meant it in every possible way. Are these the kind of discoveries you are talking about? Science, is such an incomplete and such a changing domain, which ever aspect of it you choose to look at. But SCIENCE is glorified as if it explains EVERYTHING; as if it is ABSOLUTE knowledge. ". . . science is also important because it promotes critical and systemic thinking." Ahmed, this is nothing but rhetoric propagated by materialists. Do not buy this sort of arguments. Just THINK for yourself. Ali, I do not see how the establishment of such a center undermines religion in any way. An organized study of the Muslim civilization's collective response to Science is all the more important because Science is the defining characteristic of all developed and progressive nations.Religion is important but if practiced in a culture devoid of inquiry, can be grossly misused. Thanks Mehr - and so glad to see your science-themed blog from LUMS!